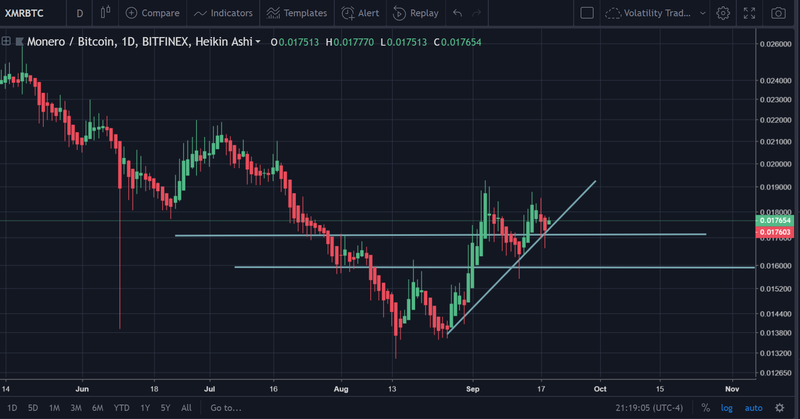 Given Monero’s bullish price action as of late, it has received a slew of attention around the crypto community for its stellar performance. Therefore, we’re going to go ahead and cover the coin again to see what’s happened since we last took a look at it. The former price analysis on Monero can be found here and here. The chart above displays the XMR/BTC pairing on the H4. The second panel shows the Zero_n0ncense BoP RSI Xtreme (unreleased). 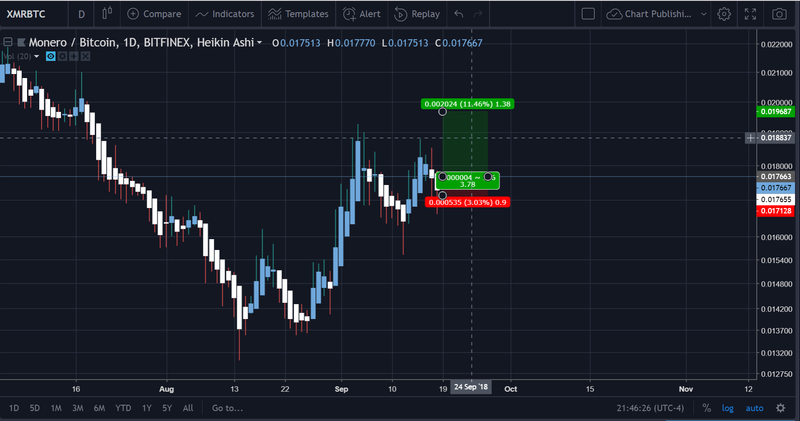 This indicator takes the Balance of Power and shifts it to an RSI scale in a smoothed manner while infusing a couple of additional elements to dictate signals of impending reversal. The purpose of this indicator is to allow the trader to anticipate a reversal in the price as early as possible. As we can see in the picture above, the BoP RSI Xtreme was effective in doing just that. From this along with past data, we can validate that this indicator is valid. We’ll keep that in our backpocket when assessing additional XMR charts on different time frames and against the USD/USDT pairing. What should be immediately apparent to those that are looking at the chart for the first time is that the uptrend that’s been in effect since late August has held true. 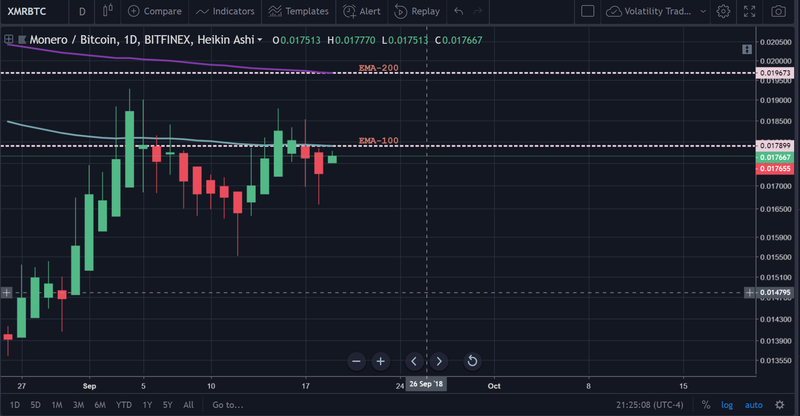 If the price of Monero holds on the daily, then this would be the third time that the uptrend has been tested successfully without a throwback in the price. The transparent green boxes in the picture above symbolize the three times that this uptrend line has been tested. According to modern trading theory, the third time’s the charm (i.e., if a line is tested more than three times, it can be considered ‘valid’; only two times is iffy). 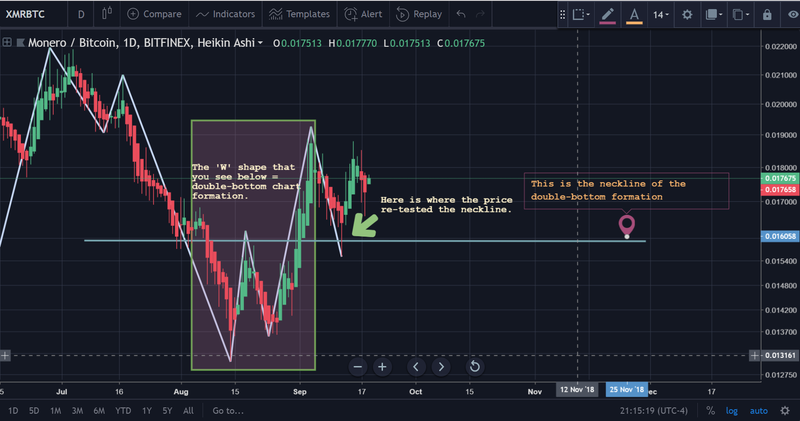 What’s even more important to remember than the ‘target’ that’s established by the double-bottom pattern is the fact that it most often indicates that there is a trend reversal of some sort that has occurred. 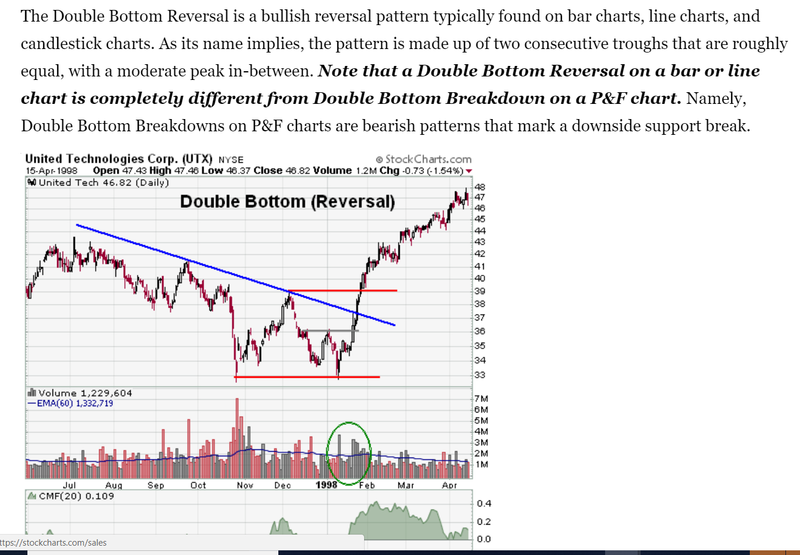 Reversal does not mean trend break. Thus, a trend reversal from a downtrend = uptrend. And indeed, the uptrend did begin on the second dip of the ‘W’. So, the takeaway here is that the price is pretty firmly nestled with the uptrend serving as a reliable support (at this point) on the daily with an additional support point that exists right below the current price. On the chart above, we can see the EMA-100 (blue line) and the EMA-200 (purple line). The current value of both exponential moving averages are marked with a dotted dash line. From our studies in EMAs, we know that when the price is above the EMA, it serves as support, when it is below, the EMAs serve as resistance points. Thus, the two EMAs that you can see above are resistance points. EMA 12 > EMA 26 > EMA 50 = positive; Shows there’s been some subtantive bullish momentum. For Heikin Ashi, the EMA-12 appears to be holding. If it continues to hold, then breaking through the overhead support points that have been established by the EMA-100 and EMA-200 should not be difficult. To reiterate, the EMA-50 tends to be the most reliable (in crypto at least), when it comes to ‘standing its ground’ as a resistance/support point. This bodes well for Monero bulls. 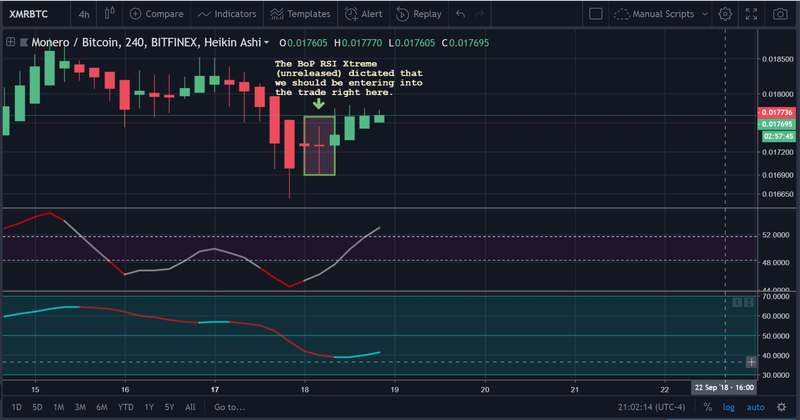 In the above picture, you’ll spot the RSI(14) for the daily chart. 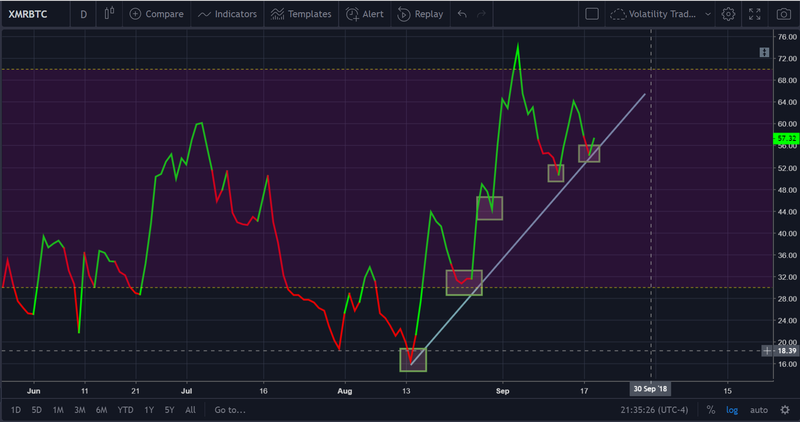 The reason why there are green and red colors are because this is a specialized RSI by the author of the article (like the other one), that is designed to render buy and sell signals. The indicator is currently unreleased (will be avaialable soon). 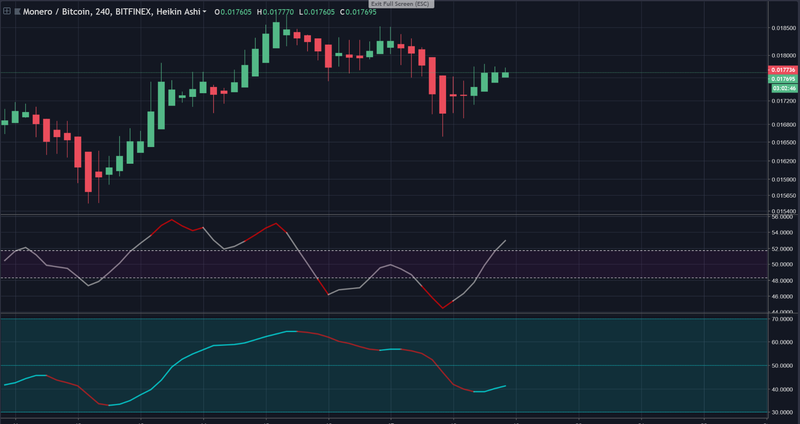 As we can see on the chart above, the RSI(14) has shown stepped improvement and is not currently overbought on the daily. 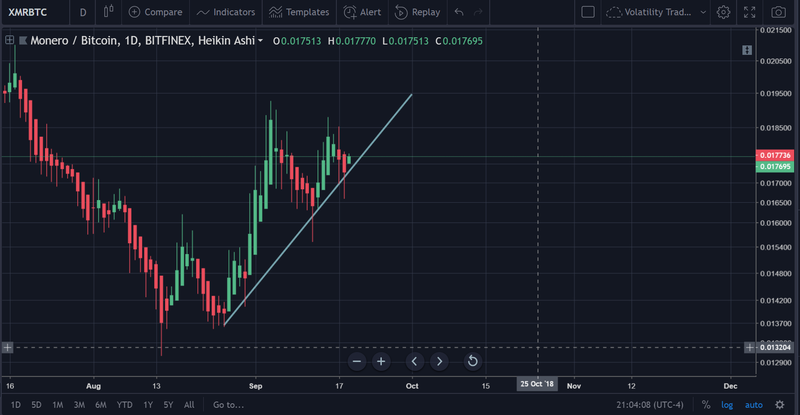 The trendline is placed in the photo to help illustrate the trend of the RSI in general. 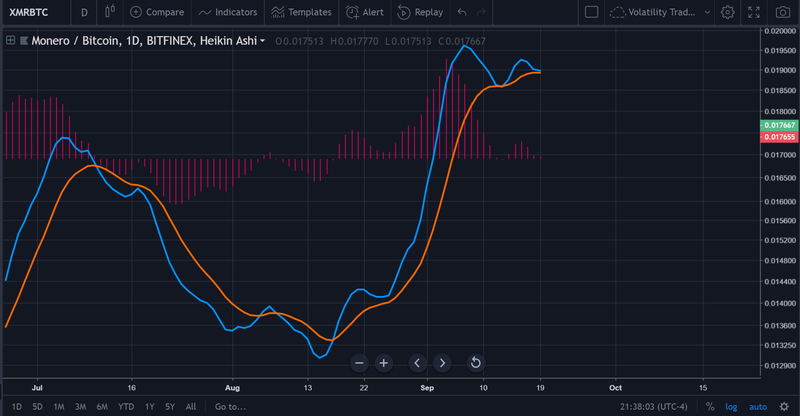 While it seems like investors should be wary of the MACD indicator’s reading above (especially since it looks like it just flashed a preliminary sell signal), it should also be noted that there was not a cross in the MACD (that’s the sell/buy signal confirmation). 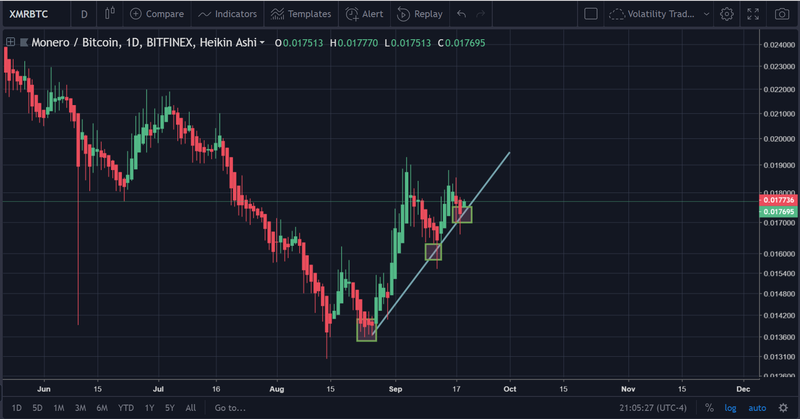 Thus, the trend (uptrend) is still technically confirmed on the daily. The MACD mostly reflects the price action anyway, from the author’s standpoint. 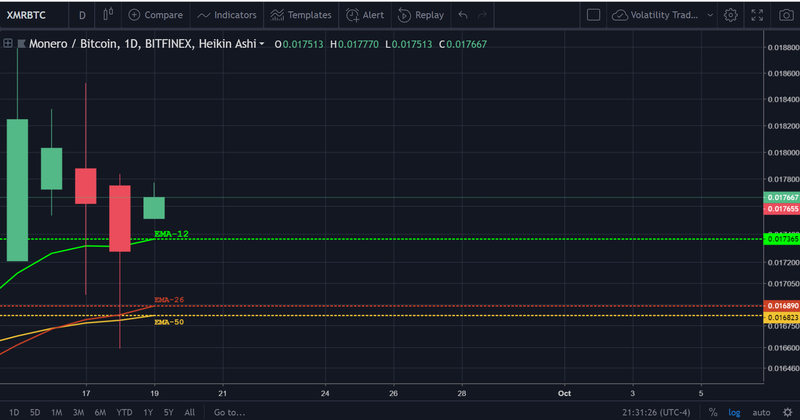 The MACD would more than likely signal a sell if there were sideways movement for another day or so, which would be indicative of a technical ‘break’ uptrend that the price is trading against, which would mean that the support point we plotted that’s directly below where the price is now would become the next target. 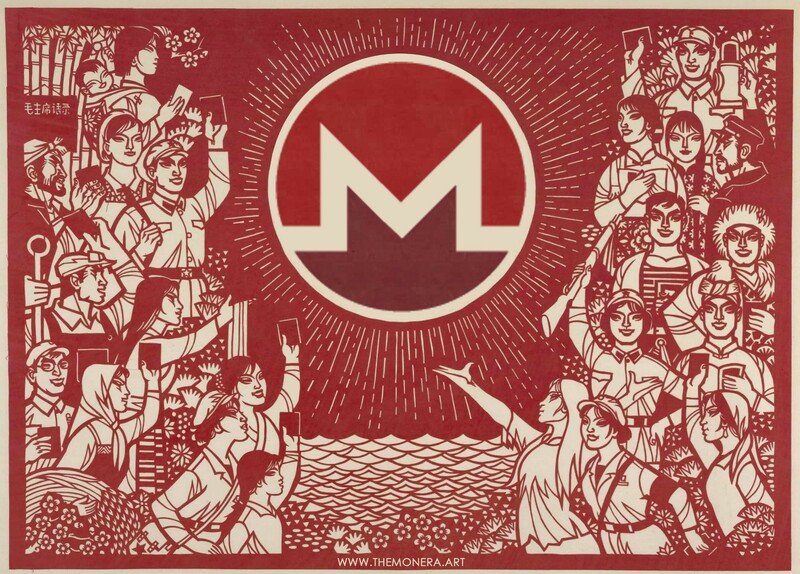 In Conclusion, there are a fair amount of reasons for why one should be very bullish for Monero currently. 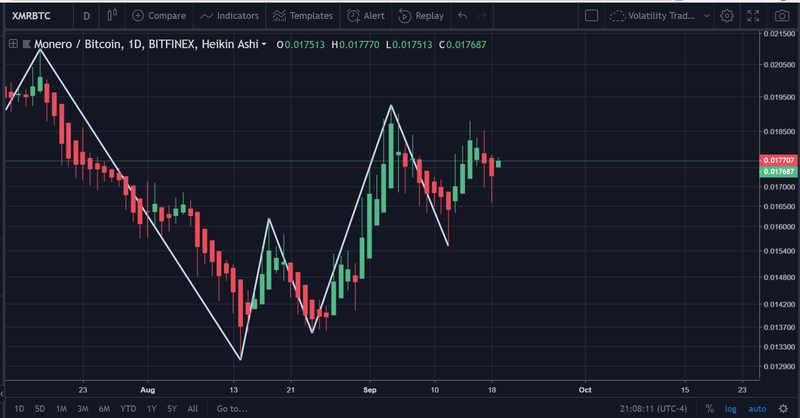 We’re reviewing the XMR / BTC pairing and not the XMR /USD(T) pairing. This is important because our earlier prediction with Bitcoin anticipated another rise on the price of Bitcoin. Therefore, the price of Monero (USD-wise), may accelerate even further. This opens up the trading strategy of investing in a long position on Monero to enhance one’s fiat profit gains, then consolidating the gains by exiting the position then entering a position in Bitcoin after its next consolidation phase or until another coin is found that shows prolonged appreciation against the price of Bitcoin. The majority of the signals and patterns that we identified on the chart appear to be largely bullish in nature. This is yet another good sign. The sentiment toward Monero has been positive in general. This is something that’s underrated and often overlooked, but it can become a great catalyst for the price action of certain assets/currencies.